World number nine Rory McIlroy continued to struggle with his swing as the men eager to join him on the full European Tour took control of the second round at the Egyptian Open presented by SODIC in Cairo on Thursday. A disappointing two over par 74 saw the Holywood star squeeze through to the final two days of the $250,000 Challenge Tour event - but he remains a massive ten shots adrift of tournament leader Lee Slattery of England on nine under par. And while Cairo’s notorious desert wind finally blew across the course, McIlroy refused to blame his poor showing on the blustery conditions. “Yeah, it was windy enough and quite tricky but it was really much the same as yesterday when I couldn’t really get anything going,” he said after a round that contained three bogeys and just one birdie. “I’m not hitting it great to be honest - it’s just one of those things. It’s not what I came here to do but if I’m going into the weekend eight or nine shots behind then that wouldn’t be too bad. I’d take that. “There’s definitely a good score out there but I need some good golf swings. I mean I hit a really nice tee shot on the tenth and left myself 104 yards to the pin and I missed the green by about ten yards to the left – it’s stuff like that which is quite frustrating. If the Ryder Cup star is to make any headway in the tournament prior to rejoining his colleagues on the full European Tour, he will need to up his game considerably as Slattery continues his march out of the lower division. Currently lying 21st in the Challenge Tour rankings, the 32 year-old shot a superb 66 to add to his opening round 69 to move to nine under par (135), one shot ahead of Scotland’s George Murray and overnight leader Alessandro Tadini of Italy. “I just didn’t put a foot wrong today,” he said. “Everything has felt pretty good this week and it is not often that you come into a tournament feeling confidence throughout every aspect of your game – hopefully I can keep it going for the next two days. While the battle for the oldest trophy in Middle East goes on, for most of the regional pros and amateurs it’s the end of the road with only UAE-based golf in Dubai ambassador Ross Bain managing to last the distance. “I didn’t play well but I’m happy to have made the cut – to be honest I’m surprised still to be here after double bogeys on two par threes,” said Bain after rounds of 72 and 75 saw him finish on three over par. The UAE’s promising amateur Ahmed Al Mosharrekh bowed after a second round 79 (+7) saw him finish on twelve over par for the tournament. Egyptian hopefuls Amr Abou El Ella (+10), Ayman Mahmoud (+10), Mamoudh El Sheikh (+12), Abdel Monem El Shafei (+17), Soliman El Assar (+24) and Abdul Hassan Salam (+26) also failed to make the cut. As well as attracting McIlroy and an international field, the Egyptian Open 2010 presented by SODIC also enjoys support from the Egyptian Tourist Authority, Mercedes, Egypt Air, JW Marriott, Mirage City Golf Club, Julius Bär Advisory SAE, Dell, Drexel, Club Car, Hydroturf, Toro, Microsoft, Global Brands, Toshiba, Heineken, Coca Cola, Dockland, Titleist and ECCO. 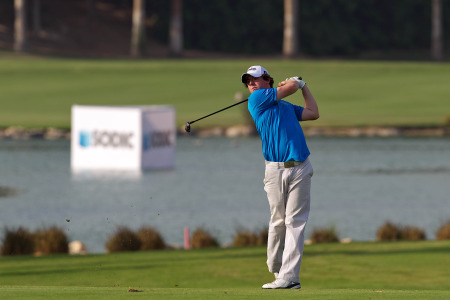 Rory McIlroy birdied four of his closing six holes to get to grips with his game at the European Challenge Tour’s Egyptian Open presented by SODIC.